Plans to build a large Islamic university in a little town in Italy’s south have divided its residents. The project’s author hopes to challenge prejudice against Muslims, but is struggling with people’s fears of a changing city and extremist threats. Giampiero Khaled Palladini, a Muslim convert and the president of Confime, a confederation for Mediterranean businesses, believes it could become “an instrument for peace” in the town of Lecce which is proud of its openness. “We need something that could help change people’s attitudes towards being Muslim,” he toldThe Local. According to his project, the university for 5,000 students would teach philosophy, literature and theology. However, Andrea Caroppo, regional adviser for the center-right Nuovo Centrodestra party, says this controversial project still has a lot of blank spaces to work on. “I read that you would like to teach ‘Theology’ and ‘Law’. But you do not say in what language it will be taught and if there will be any control from Italian authorities,” he said. The university will be created on similar model to that of the Catholic University of Milan and will be available to students from both Italy and abroad. While it still needs accreditation from the Ministry of Education, the first 50 applicants have already enrolled in Arabic language and Islamic theology courses. Meanwhile local residents worry that so many students in the historic town in Puglia’s Salento region, which has a population of just 95,000 people, will completely change its character, The Local reported. On Saturday Palladini announced that the project has been registered and land obtained on the outskirts of Lecce to build the campus, which will include accommodation, sports facilities and a mosque. 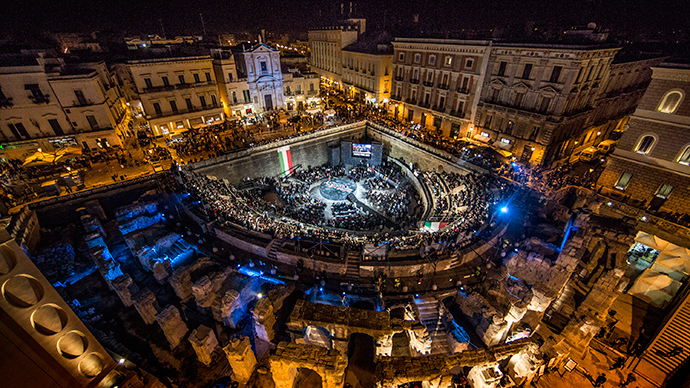 But the mayor of Lecce Paolo Perrone, last week told the local newspaper Quotidiano di Lecce that “at this particular time in history, the city isn’t ready”. Locals’ attitude towards Islam is spoiled by rising fears of threats from extremist groups. Attracting more Muslims to the area may instigate the escalation of tensions in the city. Liga Nord party leader Matteo Salvini, who over the weekend gathered thousands of people in center of Rome protesting among others against Italy’s migration policy also opposed the Islamic college launch in Lecce: “I am concerned about the fanaticism of one religion, of a certain interpretation of Islam, which is the only one that has this ‘fundamentalism,’” he stated, adding that he said “absolutely not” to the possibility of a university. A councilor from the city’s planning unit Severo Martini, who last month rejected Palladini’s request to renovate a former tobacco factory to house the university, says the project has “caused alarm” among residents, especially after deadly attacks by Islamic extremists at the office of Charlie Hebdo, a satirical magazine, in Paris two months ago. After the tragedy, the mayor of Italy’s Padua said that no more permits will be given for the construction of mosques in the northern Italian city. Palladini has not yet revealed any exact sources but says they are mostly private donors from Arab nations, including Qatar and Kuwait. He says he already have secured a number of pledges for the needed €45 million to launch the university. Europe is concerned that Middle Eastern states’ funding of the construction of mosques could be a ‘hidden promotion’ of radical Islam. On account of these fears, Austria banned the foreign financing of mosques in February.